Ranger 6, 7, 8, and 9 were the so-called Ranger Block 3 versions of the Ranger spacecraft. The spacecraft consisted of a hexagonal aluminum frame base 1.5 m across on which was mounted the propulsion and power units, topped by a truncated conical tower which held the TV cameras. The spacecraft carried six television vidicon cameras, 2 wide angle (channel F, cameras A and B) and 4 narrow angle (channel P) to accomplish these objectives. The cameras were arranged in two separate chains, or channels, each self-contained with separate power supplies, timers, and transmitters so as to afford the greatest reliability and probability of obtaining high-quality video pictures. No other experiments were carried on the spacecraft. Two solar panel wings, each 73.9 cm wide by 153.7 cm long, extended from opposite edges of the base with a full span of 4.6 m, and a pointable high gain dish antenna was hinge mounted at one of the corners of the base away from the solar panels. A cylindrical quasiomnidirectional antenna was seated on top of the conical tower. The overall height of the spacecraft was 3.6 m.
Propulsion for the mid-course trajectory correction was provided by a 224-N thrust monopropellant hydrazine engine with 4 jet-vane vector control. Orientation and attitude control about 3 axes was enabled by 12 nitrogen gas jets coupled to a system of 3 gyros, 4 primary Sun sensors, 2 secondary Sun sensors, and an Earth sensor. Power was supplied by 9792 Si solar cells contained in the two solar panels, giving a total array area of 2.3 square meters and producing 200 W. Two 1200 Watt-hr AgZnO batteries rated at 26.5 V with a capacity for 9 hours of operation provided power to each of the separate communication/TV camera chains. Two 1000 Watt-hr AgZnO batteries stored power for spacecraft operations. Ranger 6 was launched into an Earth parking orbit and injected on a lunar trajectory by a second Agena burn. The midcourse trajectory correction was accomplished early in the flight by ground control. 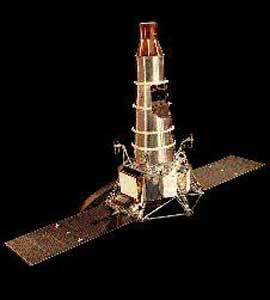 On 2 February 1964, 65.5 hours after launch, Ranger 6 impacted the Moon on the eastern edge of Mare Tranquillitatis (Sea of Tranquility). The orientation of the spacecraft to the surface during descent was correct, but no video signal was received and no camera data obtained. A review board determined the most likely cause of failure was due to an arc-over in the TV power system when it inadvertently turned on for 67 seconds approximately 2 minutes after launch during the period of booster-engine separation. Ranger 7 reached the Moon on 31 July. The F-channel began its one minute warm up 18 minutes before impact. The first image was taken at 13:08:45 UT at an altitude of 2110 km. Transmission of 4,308 photographs of excellent quality occurred over the final 17 minutes of flight. The final image taken before impact has a resolution of 0.5 meters. The spacecraft encountered the lunar surface in direct motion along a hyperbolic trajectory, with an incoming asymptotic direction at an angle of -5.57 degrees from the lunar equator. The orbit plane was inclined 26.84 degrees to the lunar equator. After 68.6 hours of flight, Ranger 7 impacted in an area between Mare Nubium and Oceanus Procellarum (subsequently named Mare Cognitum) at approximately 10.35 S latitude, 339.42 E longitude. Impact occurred at 13:25:48.82 UT at a velocity of 2.62 km/s. The spacecraft performance was excellent. Ranger 8 reached the Moon on 20 February 1965. The first image was taken at 9:34:32 UT at an altitude of 2510 km. Transmission of 7,137 photographs of good quality occurred over the final 23 minutes of flight. The final image taken before impact has a resolution of 1.5 meters. The spacecraft encountered the lunar surface in a direct hyperbolic trajectory, with incoming asymptotic direction at an angle of -13.6 degrees from the lunar equator. The orbit plane was inclined 16.5 degrees to the lunar equator. After 64.9 hours of flight, impact occurred at 09:57:36.756 UT on 20 February 1965 in Mare Tranquillitatis at approximately 2.67 degrees N, 24.65 degrees E. Impact velocity was slightly less than 2.68 km/s. The spacecraft performance was excellent. Ranger 9 reached the Moon on 24 March 1965. At 13:31 UT a terminal maneuver was executed to orient the spacecraft so the cameras were more in line with the flight direction to improve the resolution of the pictures. Twenty minutes before impact the one-minute camera system warm-up began. The first image was taken at 13:49:41 at an altitude of 2363 km. Transmission of 5,814 good contrast photographs was made during the final 19 minutes of flight. The final image taken before impact has a resolution of 0.3 meters. The spacecraft encountered the lunar surface with an incoming asymptotic direction at an angle of -5.6 degrees from the lunar equator. The orbit plane was inclined 15.6 degrees to the lunar equator. After 64.5 hours of flight, impact occurred at 14:08:19.994 UT at approximately 12.83 S latitude, 357.63 E longitude in the crater Alphonsus. Impact velocity was 2.67 km/s. The spacecraft performance was excellent.